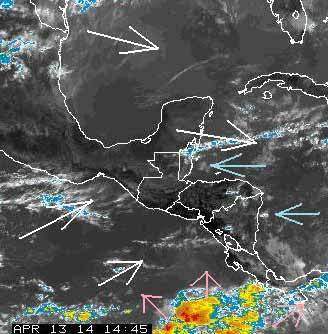 Belize NMS: Mainly good weather expected during the next 24 - 48 hours. 24-hour forecast: Sunny with cloudy periods today, partly cloudy skies tonight and sunny with cloudy periods tomorrow. Showers will be generally isolated. Today: Winds: E/SE 5-15 kts. ; seas: Choppy; waves: 2-4 ft.; isolated showers. Tomorrow: Winds: E/SE 5-15 kts. ; seas: Choppy; waves: 2-4 ft.; isolated showers. Marine Outlook: Monday night:- Winds: E/SE 5-15 kts. ; seas: Choppy; waves: 2-4 ft.; isolated showers south. General Outlook: Through to Tuesday morning: Continuing mainly good weather with only isolated showers. The sea is calm around Ambergris Caye this morning. Our expected high is 87. Generally a sunny day, but with a large amount of cloud around, at lease early. . . .The odd shower down in the lowlands of Toledo. The Caribbean Easterly winds predominating, There is a strange line of high level cloud stretching from north Belize to way beyond Cuba, which appears to indicate there is still a bubble of cool air over the Gulf of Mexico, pushing down a little.